SAP, a global software giant based in Germany has partnered with the DreamOval Foundation to improve the quality of ICT education for teachers in Ghana.Under the partnership, SAP would assist the DreamOval Foundation to develop strategies to offer free ICT training to teachers in the country. This agreement was reached at a meeting between the foundation and an executive team from SAP, who were on a two-week working visit to the country.Members of the team were Mr Franz Hero, Senior Vice President, Supply Chain Management & Logistics, Dr. Wolfgang Fassnacht, Senior Vice President, Human Resource Director, Germany and Mrs. Angelique De Vries, Head of Global Pre Sales. Dr. Wolfgang Fassnacht, during the meeting commended the DreamOval foundation for their initiative to support ICT education in Ghana.He said the foundation’s target to train teachers from less endowed schools was the best way to spread knowledge among the whole teaching population. Mr Franz Hero on the other hand advised the foundation to split their training into introductory and an advance stages to make it easier for beneficiaries to impart their knowledge to other teachers. He said the visit afforded his team the opportunity to travel to Takoradi and Half Assini in the Western region, to interact with teachers who participated in the foundation’s iTeach program in ICT for 64 teachers from the Western region. Mr Hero noted the visit was part of SAP’s Social Sabbatical initiative to work with selected NGOs in Ghana as part of their social enterprise initiative.”It is the company’s social intervention program to support various projects in emerging economies across the globe” he added. The Coordinator for the foundation, Miss Mina Asabea thanked the team for their commitment to work with the foundation to improve the free ICT program for the teachers. She assured the team of the implementation of the strategic plan drawn by the team during their visit. Dreamoval Foundation in partnership with Pyxera Global, SAP, and Ghana Education Service organized Ghana’s first Skills Gap Summit with the theme ‘Bridging the Skills Gap- Creating Enabling Synergies between Industry and Academia.’ on 27th September, 2017. Over the years, an overwhelming demand for skilled graduates in different professions has become an issue governments and heads of corporations can no longer ignore. 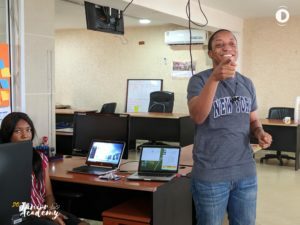 It is common to hear professionals and entrepreneurs in the working industry lament over the lack of adequate skills in graduates that are churned out of our universities. To further drive this issue, Ms Constance Swaniker, a renowned Ghanaian sculpter, in an interview with Daily Graphic, said “In most of the projects I work on, I am the only Ghanaian, most of the time they (clients) had to fly in labour because of the idea that we lack the skills. They tell you your people can’t lay things straight. Can you blame them? They have a certain standard. Our skilled labour does not think of the little innovations that make the difference. The target for these complaints, unemployed graduates, have not been silent. These individuals persistently complain about the lack of jobs and the continuous rejection they receive from companies and corporations who are reluctant about employing underskilled individuals. Most of these graduates blame their predicament on their course structures and what they studied while in school. The Ghana Employers Association largely agrees to this and recently presented an appeal to the government. 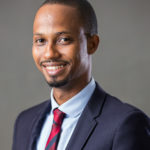 Mr Francis Ahene-Affoh, the Vice President, Dreamoval Foundation, at the summit said skills gap is a major global challenge for emerging economies and the summit was aimed at creating the platform where industry players and government officials can have a place to discuss pressing issues associated with the prevalent skills gap.This according to him would not encourage vain talk but create an avenue for commitment and points of collaboration for a successful implementation and growth of the economy. Resource persons at the Summit included Dr Fred Asamoah Kyei- the Executive Director, Council of Technical and Vocational Education and Training (COTVET). Mr Patrick AwuahPresident and Founder of Ashesi University, Mr. Derrydean Dadzie- Chief Doe at Dreamoval Ltd, Ms Angela Kyerematen-Jimoh- Country Director and General Manager IBM and Mr Roland Ato Quainoo- Chief Executive Officer, Run on Time Engineering. In his address to participants, Mr Patrick Awuah, the President and Founder of Ashesi University, explained that to bridge the skills gap there must be room for discipline, building rapport with industries, continuous assessment and accreditation systems to ensure the transformation of the country. He further iterated that education isn’t just about knowledge and skills but also character. Mr Olu Familusi, the Executive Director of SAP, called for the understanding of academia and businesses to ensure that challenges associated with skills development were tackled. The Skills Gap Summit was held in two sessions, the first was a presentation from the five (5) resource persons followed by a breakout session where stakeholders were engaged in discussions on the need to identify the skills gaps and how to bridge it for total transformation. Dreamoval Foundation in collaboration with SAP, Cape Town Science Center and the Ghana Education Service successfully organized the 2017 edition of the Africa Code Week, Train-The-Trainer workshop from the 2nd to the 4th of August 2017. The year’s edition saw a grand launch of the workshop in the Ashanti region, precisely the G.N.A.T (Ghana National Association of Teachers) hall. The inauguration in Kumasi occurred on the 2nd of August, 2017 and was performed in the august presence of Honorable Barbara Asher Ayisi Acher, Deputy Minister of Education, in charge of Primary and JHS along with some members of the SAP Executive team, Business One team and teachers in the region. 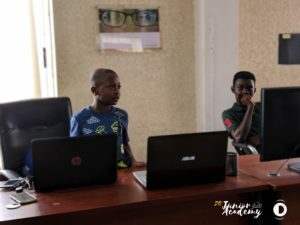 Africa Code Week(ACW) is a continent-wide initiative to spark the interest of African children, teenagers and young adults in software coding. 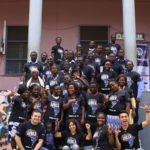 Spearheaded by SAP in 2015 as part of its social investments to drive sustainable growth in Africa, Africa Code Week (ACW) is the story of hundreds of schools, teachers, governments, businesses and nonprofits getting together to give birth to the largest digital literacy initiative ever organized on the African continent. Strong public-private partnerships are the driving force behind the initiative’s ambitious goals and ability to secure effective youth employment interventions across the continent. Ghana ranked third in 2016 with a total of 51,710 trained students. In preparation for live October events of ACW, SAP deploys its own teams of skilled volunteers as part of its Corporate Social Responsibility Program. Their mission: train thousands of teachers, parents and local volunteers throughout the year, all over Africa. 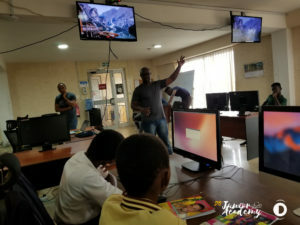 These Train-the-Trainer (TTT) sessions scale the Africa Code Week reach over all the continent by empowering teachers with skills and teaching materials that facilitate the integration of coding into the school curriculum. TTT implements these sessions in collaboration with selected organizations in participating countries. 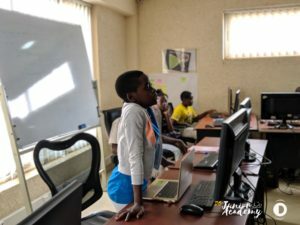 TTTs are the cornerstone of Africa Code Week’s sustainability and its ability to positively impact the lives of millions of young people along the way. Leveraging freely accessible materials and teaching tools, TTTs provide a sound, replicable structure for inter-group knowledge sharing, unlocking the potential of people to serve as resources for each other. This year, in Ghana, a total of 977 teachers were trained to use Scratch during the workshop. Out of this figure, 435 teachers were trained in Kumasi with 494 teachers and 48 circuit supervisors trained in Accra. This number is a huge leap from 2016’s workshop session, which trained 370 teachers in Accra, and the year’s target- which was to train 800 teachers in Accra and Kumasi. Volunteers from SAP Executive and Business One team, extended their reach by training 52 girls from the Achievers Ghana on 1st August, 2017. Achievers Ghana is a nonprofit, nonpolitical, nonreligious organisation with a mission to inspire, educate, and equip girls in slum communities with the necessary skills to pursue every opportunity that is available to them in order to be responsible and useful citizens. The organisation is presently at the community level with over 350 girls in the program after being incorporated under the Companies Code, 1963 (ACT 179) on the 22nd of November, 2011. For the training sessions, the team from SAP had representatives from a number of countries namely: Ireland, Egypt, Singapore, South Africa, America, France, Poland and UK. The group numbered 19 individuals with 4 executives. Seven (7) of these team members were stationed in Accra and eight (8) stationed in Kumasi for the training sessions. 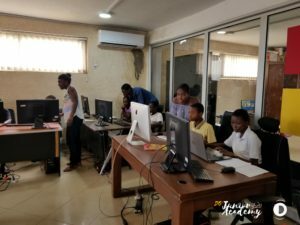 Workshop sessions in Accra were organized at The Advance Information Technology Institute- Kofi Annan Centre of Excellence (AITI-KACE) and Ashanti Region’s T-T-T sessions were held in two centres- KASS (Kumasi Anglican Secondary School) and AMAS (TI -Ahmadiyya Secondary School). The DreamOval Foundation manages all corporate social responsibility initiatives by DreamOval Ltd, a 45-person IT company founded in 2007. DreamOval Foundation was set up in 2013 with the aim of improving education in Ghana through training programs focused on youth, entrepreneurship, and business professionals. The organization’s core program, iTeach, uses the power of a pay-it-forward philosophy. Information and communication technologies (ICT) teachers graduate from iTeach with the skills needed to prepare their students for the digital economy while passing on their knowledge to their peers. There are more than 170,000 teachers working throughout Ghana. To help ensure the next generation of graduates leave school with a solid understanding of ICT, it is critical that these educators are equipped with the know-how to pass along this knowledge to their students. The DreamOval iTeach program attempts to solve this by offering school teachers a multi-day course covering various ICT topics including Microsoft Office productivity software and hardware fundamentals. In April 2016, the iTeach program was already operational and garnering many positive reviews from those who took part. However, it needed a plan to help it scale and broaden its impact country wide. As part of the SAP Social Sabbatical for executive engagement, three executives from SAP spent two weeks on the ground in Ghana getting briefed on the program and its national aspirations, and were tasked with developing a game plan that would help iTeach reach new heights. 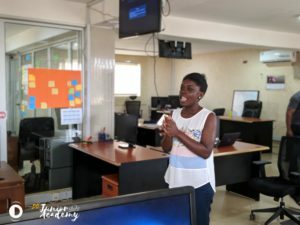 Following up on the work of the executive team, DreamOval Foundation was chosen as a partner for the Africa Code Week initiative, which is led by SAP and aims to empower future generations with the coding tools and skills they need to thrive in the 21st century workforce and become key actors of Africa’s economic development. In addition, a second team with the SAP Social Sabbatical for global engagement joined DreamOval Foundation in October 2016, and was given four weeks to carry forward the work initiated by the executive team in April. 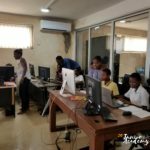 With a little more time, the team composed a detailed plan that would help iTeach move closer to its ambition of bringing ICT training to all teachers in Ghana. Recommendations included expanding the program using freely accessible massive open online courses, measuring impact and success, and finding partners DreamOval Foundation could work with to extend its mission further. To accelerate the size and scope of the iTeach program, the SAP team restructured DreamOval’s program to become a two-day basics course followed by a three-day advanced course. Teachers who complete the basics program and pass their knowledge on to three additional teachers receive a special certificate and enrollment into the advanced program. This small change makes it possible to reach far more educators without requiring additional resources. 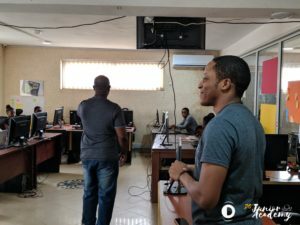 Complementing the work around the training program, the team with SAP Social Sabbatical also supported DreamOval in implementing Africa Code Week, resulting in training 500 teachers and teaching 51,700 young people in Ghana basic coding skills. Africa has the highest concentration of young people of any continent. Ghana’s youth, at 57% of the total population, is slightly ahead of the curve compared to its neighbors. As Ghana looks to benefit from digitization to solve issues in the public domain and gain competitive advantage in the private sector, it will be able to rely on the many students who will graduate from school with more ICT knowledge thanks to the iTeach program. 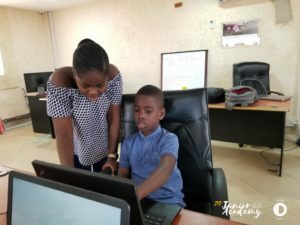 With aspirations of building an ICT training center to train more teachers year round and bringing the iTeach program to other African nations, the foundation is dreaming big and SAP is happy to help. Prior to the SAP Social Sabbatical partnership with DreamOval Foundation, approximately 60 teachers each year successfully completed the one–week ICT program. After adopting some of the proposals from the SAP Social Sabbatical for executive engagement, more than 360 teachers will receive their certificate of completion within 2017. And now DreamOval, the parent company of the DreamOval Foundation, is also a business partner with SAP as a result of the relationship developed through SAP Social Sabbatical and Africa Code Week. Three days before the October edition of DOTTS, Keren (a colleague) walked to my desk and whispered “Ese we would like you to coordinate DOTTS this Friday” I startled…looked around me and came back to look at her face and asked, “why should I do it?” I startled not because I couldn’t do what she was asking me to do, but I realized I haven’t been to any DOTTS session before. Moreover, I was barely a month old with this wonderful and amazing family (we call ourselves DOers). When Keren left my table I started to ponder, I hadn’t hosted any program in ages. Truth is I didn’t prepare until the day came. Few hours to the event, I was handed the programme outline and a BIO of the guest speaker. At about 6:00pm my colleagues and I began to head towards the venue. When I entered the hall I could count about 6 to 10 people who were chit chatting. Before the programme began, there was time for networking while guests were served with soft drinks and some pastries to nibble on if you were hungry. That was just timely because most of us were tired and hungry. We couldn’t help but do justice. A lot more people trooped in during the network session and before i knew it, it was time to set the ball rolling. Beginning with a prayer and a brief introduction of what DOTTS is all about, I got my audience looking and listening to me with rapt attention. The nervousness was gone and I just had to flow. I interacted with a few and smiled to the crowd which made them connect with me. Since this was my first time at DOTTS, I had the opportunity to make this my way and have a style that will make everyone comfortable. Before I could finish telling the audience about DOTTS, KSM walked in and I began to feel a bit nervous. Why do I have to feel intimidated because our guest of honour is in? I asked myself. Come on Ese….you’ve got this! And I took control once again, wowing the audience. After the introduction, KSM took the floor. As usual, he broke the ice with a joke. There was never a dull moment through his presentation. KSM was undoubtedly compelling just holding our attention with his wise words and witty jokes. KSM shared fond memories from his childhood and how he was always among the last in his class. In fact his teacher referred to him as “Tiwee”(in his own words meaning dumb). His father described him as a boy who did things haphazardly but accurately (what a description). He shared with us most of what he went through growing up from how he realized he had Sickle cell, which made him unable to go to Mfantsipim, his preferred choice. Instead, he went to PRESEC for a year. Thankfully, his father was the moderator of the Presbyterian church by then. I wish I could go on and on to tell you about all that he shared with us that evening. Ahaaa….before I forget, he was in NAFTI for a year and it was there that his creativity kicked in. He played a one man show as seven distinct characters. He confessed that he hadn’t had any show of that nature ever since. Can you a imagine? ADONBILIVIT! One person playing seven characters. How did he do that? Trust me that must be a lot of work. After that particular show, a man from the crowd met him and advised he furthers his education in the United States. 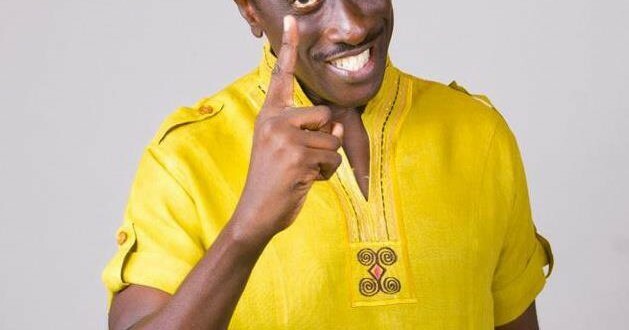 In the US, KSM studied Drama and Communications. It was in the United States that he realized a drastic change in his academic performance and he became one of the best students. I can go on and on and on…during his presentation, he will chip in jokes here and there…of course, you have to expect that from someone who has a very high sense of humor. I learnt a few things; that whether or not the system favours you, you need to question the “HOW”. In that case, you are not limiting your creativity to knowledge. No matter how knowledgeable you are, if you don’t apply it to creativity, it won’t work. We need to do more than just learning. We need to apply. It makes us better people. My first DOTTS was just amazing. I give God the glory that I made my bosses and colleagues proud. Everybody was proud of me and I was happy I “killed” it.